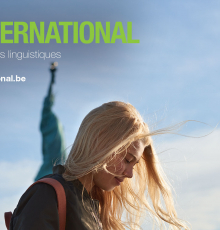 For the sixth consecutive year, the Go International fair will take place at Brussels, the 23th and 24th of February at the Louise Centre (Avenue Louise, 279), from 10h to 18h. The Go International fair is a great scope for anyone to discover the different opportunities that exist in term of language travels, language courses abroad, studies abroad and international careers. Check the full conferences program, the partners that will be present during the fair and book your free ticket on www.gointernational.be.